Facebook ad campaigns is becoming a staple part of social media strategy and brands are investing heavily on ad campaigns to maximize reach and get more engagement. Getting conversions is one of the primary reasons why businesses run ads. There is always a strategy which enables some ads to get achieve positive ROI. 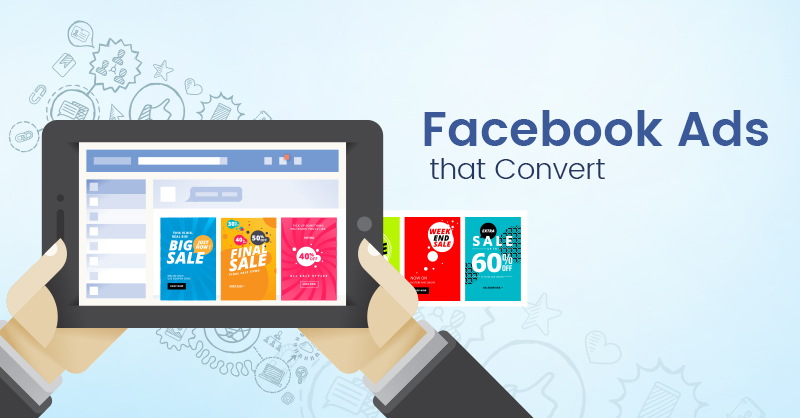 In this post, we’ll share with you the tips to create & run conversion-focused Facebook Ads. Ad positions on Facebook serve different purpose and goals. For example, ads that appear on the right are mostly for likes and page engagement. You will see sponsored ads on your timeline depending on the kind of content you’ve liked before and such ads lead to attractive conversions. Facebook ads is all about targeting well geographically, demographics, interests and behaviours. These are the people who are genuinely interested in your business products. The social channel lets you choose your audience manually, uploading your existing contact list and use customer information to find similar people. The more specific your targeting, the more you will be able get more conversions. Adherence to Facebook ad policies is important when it comes designing images and copy. There are times when images get rejected disapproved, hence it’s good to experiment with ad images to know which picture appeals to target audience. Choose multiple images for ads as it is easy for you to know which ad performs best and get the most out of the money you’ve spent on ads. Create landing pages which is an extension of your Facebook Ad. Make sure you’re consistent with the kind of content you add on the landing page that matches with your ad. You also need to dig into the wonderful world of conversion rate optimization on your landing page. Facebook relevance score is calculated based on the positive and negative feedback that is received from its target audience. Understanding relevance scores helps advertisers to lower the cost of reaching people, test ad creative options before running a campaign and help optimize campaigns already in progress. Use specific call-to-action (CTA) for ads you run. Do not use generic call-to-actions like “contact us” or “know more.” For shopping ads one can use “Shop Now” or “Buy Now”, while travel ads can use CTAs like “Book Now” or others. A lot depends on using specific CTAs for different products, which can improve your ad’s conversion rate. Look up for competitor ads on Facebook, which will help to evaluate how they are promoting their product. It will also help your brand to know what features they have used for ads and what is their strategy to derive maximum conversions. Although paid ads would help you to garner interest from target audience and conversions, it’s significant that your brand also does organic posts. Both paid and organic posts would help you to improve conversions. Make sure your brand keeps testing at all stages. Facebook ad testing is especially important split testing helps your brand to know which are the ones that convert best. There are a lot of other tools that help you brands to improve conversions. It is good to experiment the ones that give you best results. Do you know any tricks that help you boost conversions? Let us know in the comments below. At Futurescape Advertising, we provide not just Facebook advertising solutions, but also a plethora of social media marketing solutions based on the objective your business wants to attain. We are one of the leading advertising and digital marketing companies in Navi Mumbai. Get in touch with us now! Awesome! This may be one of the most useful things on the topic I’ve ever found. Many thanks for your work.